TC's much-anticipated November 2 launch event is likely to see new U-series smartphone unveiled. Now, a new HTC smartphone has been spotted on TENAA, the Chinese certification site which is a good source of leaks, ahead of official launch. Additionally, the alleged HTC U11 Life has also been spotted on GeekBench benchmark site suggesting some innards of the handset. 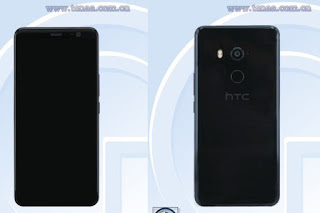 Based on TENAA listing images, the alleged HTC U11 Plus is likely to sport an 18:9 aspect ratio display, which has been lately seen on a lot of premium and mid-range smartphones. The leaked image of the back panel looks to sport glass-like finish and features fingerprint scanner as well. The HTC U11 Plus is said to come with a 6-inch display. Unfortunately, the TENAA listing has no details on the innards and only includes images of the alleged handset. Based on preliminary leaks, the HTC U11 Plus is expected to sport a 5.99-inch display with a screen resolution of 1440x2880 pixels and an 18:9 aspect ratio. The U11 Plus TENAA listing was first spotted by Droid Life. A Geekbench listing leak from last week claimed that the HTC's next premium smartphone, presumably, the HTC U11 Plus, will come with 4GB of RAM, a Qualcomm Snapdragon 835 SoC, and run Android 8.0 operating system. Separately, the Geekbench browser benchmark listing for HTC U11 Life shows the smartphone running Android 7.1.1 Nougat and being powered by a Snapdragon 660 SoC. There's 3GB of RAM on board. The benchmark listing reveals that the unit scored 858 in single-core and 4136 in multi-core tests. The HTC U11 Life is likely to launch alongside the HTC U11 Plus on November 2. The Taiwanese handset maker, earlier this month, already confirmed that it will be bringing back the "BrilliantU", confirming that the new device will be U-branded on November 2. Both the new smartphones can be expected to come with squeezable frames, much like the HTC U11.